I meet Wilma at the AQS show this spring in Paducah. She took my class Emerging Leaves and her is her fabulous version of it. 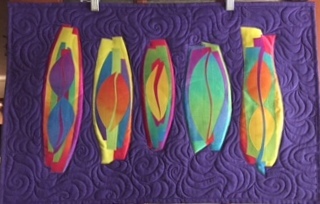 She was at the Dallas TX quilt guild meeting this Thursday and brought in her finished project. By the way her husband Floyd will have a quilt in the IQF show in Houston next month. A very productive couple. I love the purple background that she choose. I really like the leaf unit on the right end it has some fun sass to it. Thanks for sharing this with me Wilma.